The MOT test is being updated this Sunday – but half of motorists are confused about the changes. There will be new checks on emissions systems for diesel vehicles with particulate filters, brake discs and reversing lights. It will also see the inclusion of three new defect categories: dangerous, major and minor. 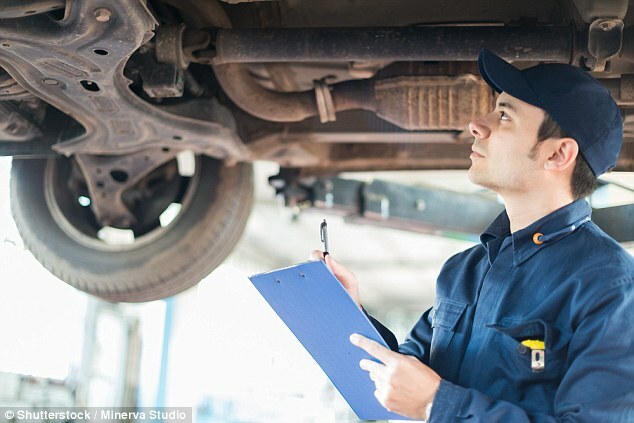 The two most serious – dangerous and major – will result in a car automatically failing an MOT and the latter – minor – refers to faults that need to be rectified as soon as possible. The RAC has now warned that the confusion could lead to thousands of vehicles being driven while having defects that desperately need to be fixed. Of 1,866 car owners surveyed by the breakdown provider, many admitted to being befuddled by the new fault categories. It was the ‘minor’ defect type that caused the most confusion, with 49 per cent wrongly assuming it would lead to an MOT fail when it actually signified a ‘pass with defects’ that need to be remedied as soon as possible. More worryingly, 74 per cent of motorists believe drivers would continue to use a vehicle listed with an MOT minor fault without having the issue fixed – regarding it as an advisory rather than something that needs to be remedied at the earliest convenience. The research found more flaws in the new three-tier fault categories. Some five per cent thought a vehicle found to have a ‘dangerous’ fault would pass the test and six per cent believed the same of a ‘major’ fault. However, both fault types would in fact result in an automatic fail and require immediate repairs before the car can be retested. If the issue is deemed ‘dangerous’, the vehicle can’t even be driven away and needs to be fixed before a wheel is turned. And the study highlighted that motorists’ general understanding on MOT tests is blurred – even when it comes to elements that have been in place for decades. For instance, 13 per cent of the panel thought an advisory would result in a fail, even though MOT advisories used to highlight problems that will need to be repaired in the future have been used for years. For some, the MOT changes are a surprise altogether. Of the drivers questioned, 56 per cent didn’t even know that the test was being adapted on Sunday – and a third of those who claimed they knew changes were afoot didn’t actually know they were being introduced this weekend. The RAC said it backed the changes, but voiced concerns that there could be some inconsistency in the way they are interpreted and applied around the country. And if their fears were to be recognised, the overall MOT failure rate may be affected which could lead to significantly more unroadworthy vehicles on our streets. Three in five (58 per cent) of respondents said the confusion could result in more cars being passed fit for use on the road that would have failed the old test and are therefore not as safe. RAC spokesman Simon Williams said: ‘It is important everyone quickly gets to grips with the changes to the MOT, and that test centres and garages do a good job of explaining the new fault categories so motorists understand correctly the severity of faults with their vehicles. ‘Changes to the MOT that make vehicles using our roads safer are undoubtedly a positive step so we hope that testers everywhere interpret and apply the new rules fairly and consistently. The new MOT rules will also see all cars older than 40 years be exempt from the test. Kwik Fit has warned that this could result in almost 117,000 classic cars that are currently declared as SORN and without a valid MOT being used on the road without being checked. One of the key changes to the MOT test from Sunday are the stricter requirements for emissions from diesel cars with a diesel particulate filter (DPF) which captures and stores exhaust soot. 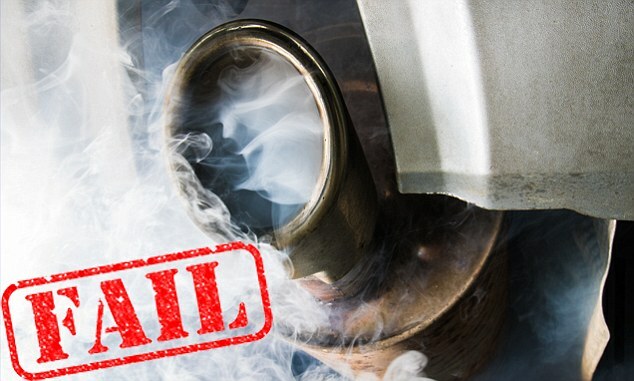 Vehicles will get a major fault if the MOT tester can see any smoke of any colour coming from the exhaust, or finds evidence that the DPF has been tampered with. 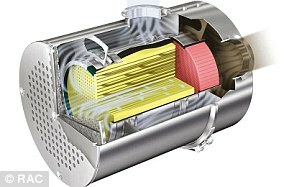 Half of motorists questioned (48 per cent) by the RAC said they currently own, or run, a diesel car, and of those 53 per cent said their car had a DPF. However, more than a third (37 per cent) didn’t know whether their vehicle had one or not. For those who don’t know, they could be stung with a fairly hefty bill if their car has one that isn’t operating correctly. Replacements DPFs often cost in excess of £1,000, which is up to four times what half of diesel drivers surveyed thought they were valued at. ‘There is rightly a lot of attention at the moment on ‘harmful to health’ nitrogen dioxide emissions from diesel vehicles so stricter rules should help to make sure vehicles aren’t emitting more than they should be,’ Williams added. A diesel particulate filter is a device that captures and stores harmful exhaust particulate matter to stop it from being released into the air we breathe. But because they only have a finite capacity, the trapped emissions periodically have to be emptied or burned off to regenerate the DPF. In real life driving terms that means making sure a diesel car gets a prolonged motorway speed run regularly. This regeneration process removes the excess emissions soot clogging up the filter, reducing the harmful exhaust emission and helps to prevent the tell-tale black smoke you used to see from diesel vehicles, particularly when accelerating hard. Euro 5 exhaust emissions legislation introduced in 2009 to help lower car CO2 emissions effectively made DPFs mandatory, and since then, around one in two new cars a year are diesels with them fitted. There are two methods of maintaining a DPF – passive and active. Passive regeneration occurs when the car is running at motorway speeds for half an hour or longer to push the exhaust temperature higher so it can start the process of burning off the excess clogged soot. Active regeneration means extra fuel is injected automatically, as part of the vehicle’s ECU, when a filter reaches a predetermined limit (normally about 45 per cent) to raise the temperature of the exhaust and burn off the stored soot.